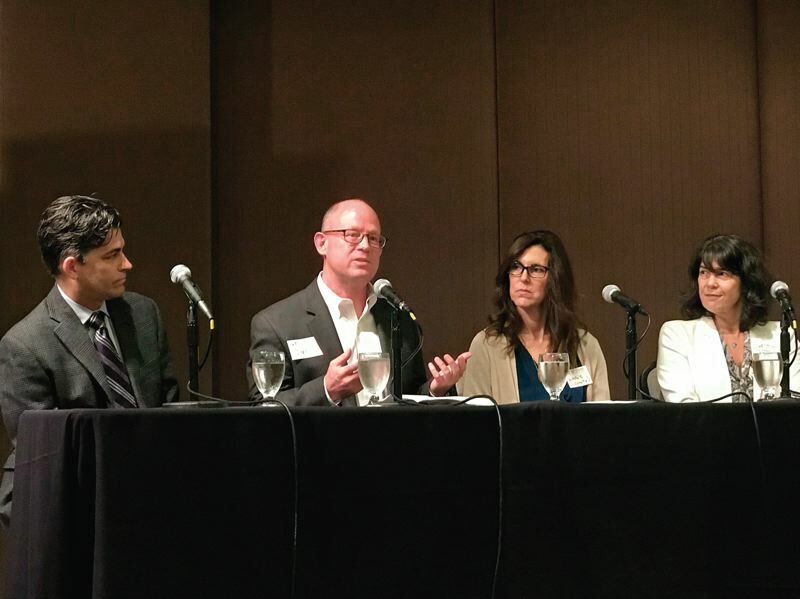 Addicts, mentally ill have few options for housing, panelists agree at Portland Business Alliance forum. The homeless crisis in Portland and other cities is exacerbated by a lack of treatment options for people living on the streets with substance abuse and mental health problems, according to Dr. Andrew Mendenhall, the senior medical director of substance abuse services for Central City Concern, the largest social service agency serving the homeless in the region. "Many homeless, 70 to 80 percent, have moderate to severe substance abuse disorders, and 30 percent have mental health issues. The problem is the lack of access to low-barrier, effective programs," Mendenhall says. Mendenhall made his remarks during the Portland Business Alliance's monthly Forum Breakfast on May 15 at the downtown Sentinel Hotel. The topic of the forum was "Oregon's Opioid Epidemic." Other panelists included Multnomah County Commissioner Sharon Meieran, employment and labor attorney Jon Benson, and Dr. Chris Farentinos, vice president of the Unity Center for Behavioral Health. According to Mendenhall, the greatest obstacle to getting off the streets is overcoming an addiction to drugs or alcohol. And at this time, for every person admitted to one of his agency's residential treatment programs, another six or seven are turned away for a lack of beds, he says. "If we had another 600 to 800 transitional housing units in the metro area, we could make a tremendous impact. We know what works; we just need to do more of it," Mendenhall says. Although Portland and Multnomah County leaders agree, no plan to fund and open that many new units in the near future currently exists. According to the Oregon Health Authority, the opioid crisis has hit Oregon harder than just about every other state in the country. The Oregon Prescription Drug Monitoring Program shows that one in four Oregonians has been prescribed opioids, with three people dying from prescription opioid, counterfeit opioid and heroin overdoses every week. Farentinos traced the beginning of the crisis back to the late 1990s, when doctors were being criticized for not prescribing enough pain medications, including to those suffering from terminal illnesses. About that time, drug manufacturers began producing a new generation of opioids, Farentinos said, which they claimed were nonaddictive. "Everyone got opioids. There were in everyone's medical cabinets," Farentinos said. But according to Farentinos, the new opioids were, in fact, addictive. 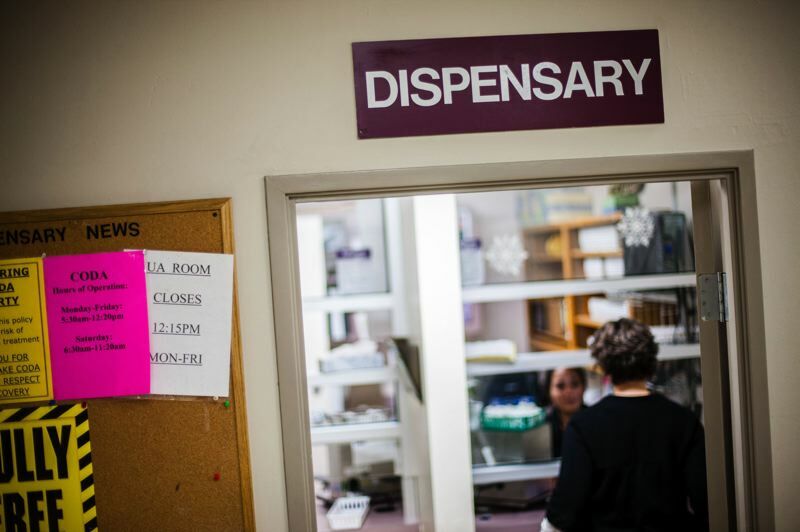 "Twenty to 30 percent of those who were prescribed opioids abused them, and 5 percent of them transitioned to heroin, which was cheaper and easier to buy on the black market," Farentinos said. Although governments now have realized the harm caused by overprescribing opioids, the problem currently is so widespread that effectively addressing it is both difficult and costly. The most successful treatment programs include supportive housing, which includes a permanent home with wrap-around services. But without insurance, most addicts cannot pay for such treatment, meaning governments have to finance it. In Portland, the city and county are struggling to provide enough shelter space and affordable housing for everyone in need. The additional services cost an average of $10,597 per unit a year, according to a report by the New York-based Corporation for Supportive Housing. Supporters argue such services more than pay for themselves by reducing emergency medical and public safety spending on the recipients. Mendenhall stressed that those who are better off have to empathize with the people living on the streets. "No one wakes up one day and says 'I wants to be a drug addict,' " Mendenhall said. Meieran warned that reducing opioid abuse by itself will not solve the homeless crisis. A former emergency room doctor, she noted that many addicts abuse multiple drugs. Methamphetamine is now killing more people in the county than opioids, Meieran said, even though the state had reduced its manufacture and use in the 2000s by restricting access to Sudafed, an over-the-counter decongestant used to produce meth in home-based labs. "It's like playing whack-a-mole. When you get a handle on one of these drugs, another pops up. Now Mexican drug cartels are now swamping the market with cheap meth, and it's a horrible drug," said Meieran. Benson talked about steps employers can take to reduce opioid abuse in the workplace, which reportedly has cost $1 trillion in lost productivity since 2001. He urged businesses to adopt and publicize drug screening programs, both for applicants and employees suspected of being impaired on the job. Random screening programs also can be effective, Benson said, but they have to be completely random to avoid legal challenges. "You can't just test workers you heard were doing drugs over the weekend. You practically have to draw names out of a hat," Benson said. During the question-and-answer sessions, several audience members said their families had struggled with relatives with addiction problems, proving it is not just a homeless issue.